I actually finished my 24th book in the reading challenge last Tuesday, but had other things I had to write before the review. 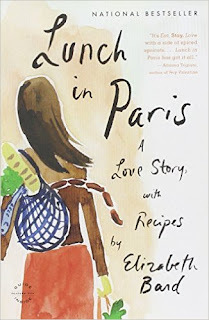 Lunch in Paris - A Love Story with Recipes by Elizabeth Bard satisfied the 17 category on the Popsugar 2015 Reading Challenge list. It was a 'book recommended by a friend.' The friend was one of the librarians in the children's section of our local library. She probably wouldn't even remember recommending it to me, as we haven't been there in month. This book had quite a waiting list for my Kindle! The book was very good, and probably would be even better for someone who enjoys cooking. The author would tell about a realization of her life while she adjusted to living in Paris with her boyfriend, who later became her husband. In the next section, she would give the recipes that were meaningful to the anecdote of her life she'd just told. I'm grateful to have finished this book last week, although I now can't help but wonder if the author is still in Paris, and if she's okay after the terrorist attacks on Friday. My thoughts are with her, the family and friends I feel like I got to 'know' a bit through her book, and all of the citizens and visitors in Paris and affected by the tragedies. I love books about food. I'll have to add this one to my ever growing to-read list. Sounds like a good read to me. Certainly timely that you read this recently. It sounds like a good book - I've added it to my wishlist.